Shuttle departs from the Glenorchy MTB Park (end of the bitumen on Tolosa St. Glenorchy). The trip to the North-South Trail head takes approx. 50 minutes. Your bike will be protected in a custom built, fully enclosed, locked bike trailer. Shuttle departs from Hobart City outside the Tourist Info Centre on Davey Street and picks up near Bus Stop 11 on Macquarie Street, Sth Hobart (near Ginger Brown and Vinnies). Direct shuttle between Maydena & Hobart. We get our customers from the Bike Park to their next destination fast and without fuss. Drop off at Hobart Airport or the city. Advise contacting us prior to booking to confirm availability. 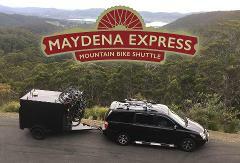 Direct shuttle between Hobart & Maydena. We get our customers to the Maydena Bike Park fast and without fuss. Pick up from Hobart Airport or the city. Advise contacting us prior to booking to confirm availability.